The Marsh marigold or Kingcup, Caltha palustris, is a British native, producing large buttercup flowers in spring. It is ideal for a bog garden or he edge of a pool. 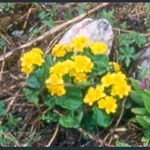 There are related species from elsewhere, some with yellow and some with white flowers. 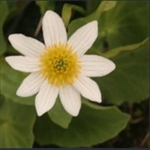 A marsh marigold with pure white flowers and shiny round leaves.